Thinking about our human past and future, I’m reminded of a terrific discussion in one of the AbsoluteWrite.com forums: Are we homo faber or homo sapiens? 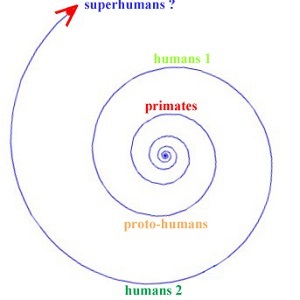 What I got out of it was that human evolution is a spiral process, one created by the back-and-forth action between us and our tools. Early primates used incidental tools found in nature (such as sticks or stones) to give them artificial body parts (such as arms or fists). This gave them an advantage over animals who had only their biological arms and fists to affect their environment. 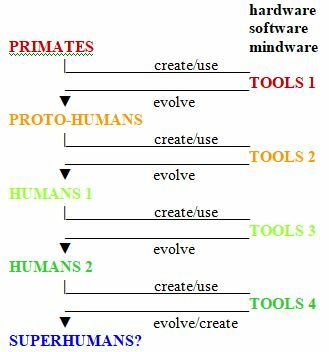 That was part one of the back-and-forth action: primates → create/use → tools. Better environmental control led to those primates who had better body parts and brain parts surviving and passing on those parts to their children. Two examples: fingers and thumbs better able to hold tools (body parts), visual cortex and manual cortex better able to imagine tool use (brain parts). This was part two of the back-and-forth action: tools → evolve → proto-humans. This back-and-forth action might better be imagined as a staircase. Each reciprocal stroke has led to a higher form of tool-using animal, ending in today’s humans. We live in tools called tents and houses and space stations, wear tools called parkas and desert robes and spacesuits, ride on or in tools called skates and wagons and spaceships. Our senses are amplified by glasses and hearing aids, our memories by scrolls and wikipedias, our minds by abacuses and computers. And all of those can be quickly and easily replaced – unlike the surgically implanted tools of the silly Star Trek Borgs. Tools aren’t just physical artifacts – hardware. Some of them are software: scrolls and books and electronically stored information. Some of them are mindware: the idea of Roman and Arabic numbers, wholes made of parts, a story having a beginning and middle and end, a marriage being a long-lasting team, kingdoms and democracies, capitalism and socialism.